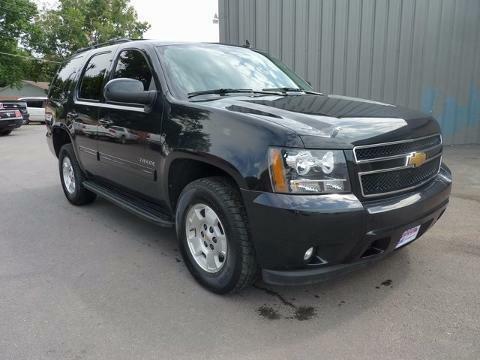 ONE OWNER LOCAL TRADE 2012 CHEVROLET TAHOE LT 4X4 WITH THE 5.3L VORTEC V8 ENGINE. THIS TAHOE IS NICELY LOADED WITH LOTS OF OPTIONS. NAVIAGTION, SUNROOF, REAR ENTERTAINMENT WITH DVD, TRAILER TOW PACKAGE, BACKUP CAMERA, 2ND ROW BUCKET SEATS, BLACK STEPS, LEATHER SEATS, HEATED SEATS, FACTORY ALUMINUM WHEELS WITH GOOD TIRES. CALL OR STOP BY FOR A TEST DRIVE!!! ---- IF WE DON'T SERVE YOU, WE DON'T DESERVE YOU! Seminole Ford proudly serving the following communities Seminole, Shawnee, Prague, Tecumseh, Wewoka, Holdenville, Wetumka, Ada, Norman, Stroud, Okemah & Meeker.